Centro de Derechos Humanos Miguel Agustín Pro Juarez, A.C.
Good afternoon. As a representative of the U.S. delegation of the U.S. Free Nestora Campaign, we are here to show our solidarity with the people of Mexico who continue to take to the streets for justice. We also are here to demand that President Peña Nieto free Nestora Salgado and all the many political prisoners especially Gonzalo Molina and Arturo Campos, currently on hunger strikes together with Nestora. The first Free Nestora Committee was organized together Nestora’s family in 2013 in Seattle, Washington. From there, the Campaign to Free Nestora grew in collaboration with the Comité Nestora Libre here in Mexico. Today, the Campaign is an international effort, demanding freedom in several states in my country, and also in Costa Rica, the Dominican Republic, Japan, Australia, Brazil, Argentina and Europe. We recognize that Mexico suffers from a government that receives military and financial aid from the United States under Plan Mérida, and know that this has bloody consequences for the Mexican people. We denounce the Plan Mérida and recognize that it is the job of us who live in the U.S. end it. The partial victory of Nestora transfer from a high security prison a few days ago took place only due to the bravery of Nestora and the pressure of an international movement that continues to demand her freedom. We all need to remain strong until all political prisoners are free. I know that our movement in alliance with other movements for justice in our hemisphere has the capacity to bring about the changes we all need as activists, workers, immigrants, as indigenous peoples and as women like Nestora Salgado and men like Gonzalo Molina and Arturo Campos. On Friday, June 5, Nestora suspended her hunger strike after six Community Police members were moved from prisons in distant areas of Guerrero state, to a local jail near their homes. 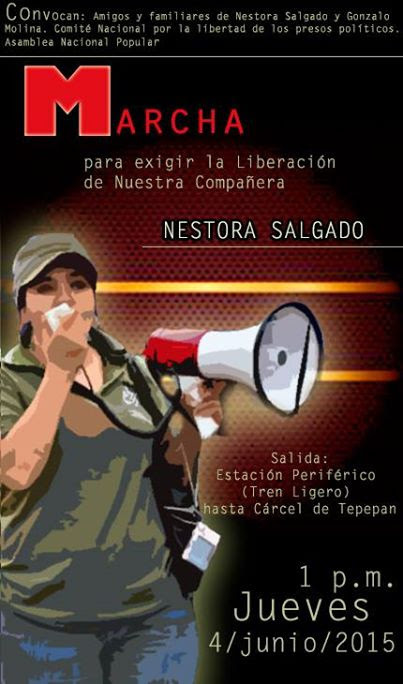 Nestora, however, remains ready to resume her hunger strike if she is not freed. She is also demanding the transfer to Guerrero of two Community Police leaders, Gonzalo Molina (who also ended his hunger strike when Nestora did) and Arturo Campos. They are currently in maximum security prisons far from their families. This weekend there was heavy government repression against activists in Oaxaca, Guerrero, Michoacán and Jalisco who were protesting the federal elections. The protesters say the elections are a farce and are demanding the release of political prisoners, an accounting for the disappearance of 43 students from Ayotzinapa, and an end to school privatization plans. U.S. military aid and equipment is being used to by the Mexican government to brutally suppress internal political dissent. End Plan Merida! A brief but heartening glimpse of Nestora. Leaders of the National Coordinator of Education Workers (CNTE), a Mexican trade union whose leaders have been camped out at the Monument to the Revolution in Mexico City while in negotiations with the Secretary of the Interior, joined a demonstration in support of Nestora Salgado today. One of the banners which led the march was brought to Mexico by the delegates of the US Campaign to Free Nestora Salgado, an ex-comandante of the community police in Olinála, Guerrero. The families of other political prisoners and teachers marched to the Tepepan prison where Salgado is being held, after she was moved at the beginning of the week from a federal maximum security prison in Tepic, Nayarit. Spirits were high as she waved out the window of her hospital room. June 4, 2015. Photo by Pablo Ramos. Thousands of angry teachers took to the streets of the Mexican capital to protest labor policies that they charge are a step toward privatization of public education and put their workplace rights in jeopardy. In addition to protesting against these policies, the teachers also called for the release of political prisoners, particularly Nestora Salgado. The protests coincided with the Campaign to Free Nestora Salgado’s visit to Mexico City. Campaign member Stephen Durham and Nestora Salgado’s daughter Grisel Rodriguez are also featured in the video.